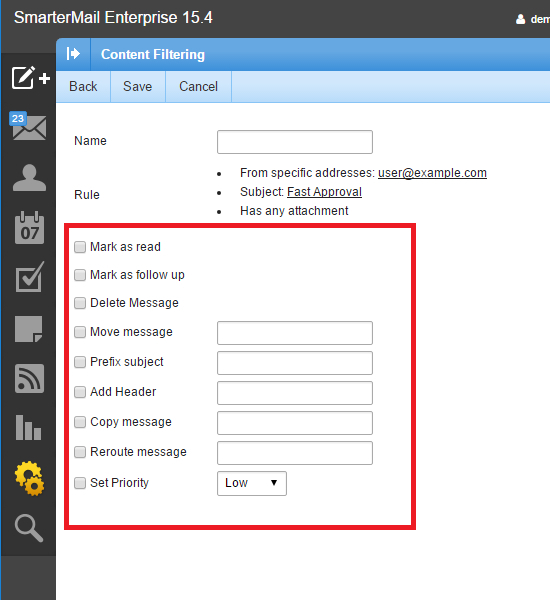 You can customize your email content and spam filtering rules from your SmarterMail interface. Domain level email filters allow you to set up filters and rules for all email address under a domain name. Domain email filters are processed on all incoming email messages sent to all email accounts under the same domain name. If there are domain-level email filters in place, the evaluation of domain filters takes place before the evaluation of account filters. Because many users may prefer to set their own filters, you may want to keep domain-level filters to a minimal and only to items that affect the entire domain. 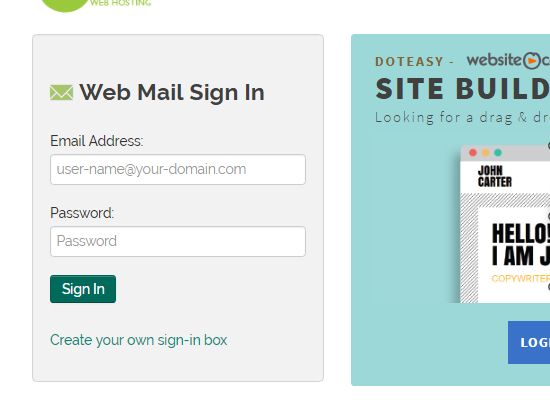 Domain level email filters can only be created from your domain admin email account. In the Email section, click Manage Email Accounts. 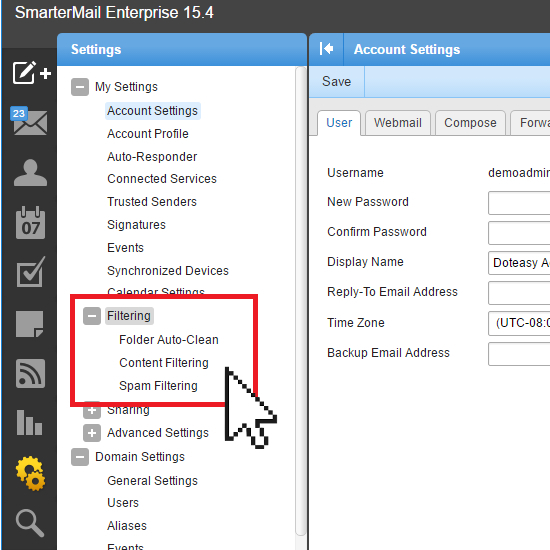 You will be logged into your admin email account’s SmarterMail interface. Select Settings from the left menu and expand the Domain Settings options. 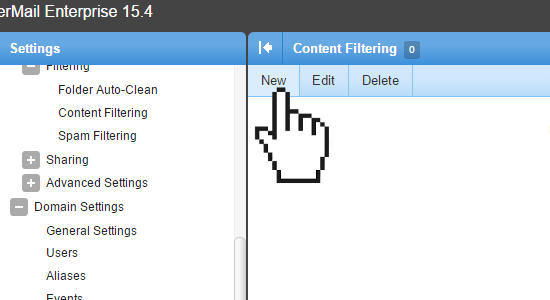 On the Content Filtering page, click New to add a new filter rule. Select the filter criteria from the page. Filter criteria are things that the filter will look at. Note that multiple criteria can be chosen and you can specify on the next page whether all criteria must be met, or only one of the criteria for the filter to be activated. When ready, click Next to proceed. If you have chosen multiple criteria in Step 7, you can now specify if you want to use the “And” modifier or the “Or” modifier. If you choose the “Or” modifier, just one criteria is needed to activate the filter. For each of the criteria you have chosen in Step 7, you will need to enter the details. For example, if you chose to filter on From address, you will need to enter an email address in the box. When ready, click Next to proceed. On this page, you will see a summary of your new filter rule. You will need to enter a name for the rule. Next, choose one or more actions to take when a message matches this filter. When ready, click Save to save the new filter rule. 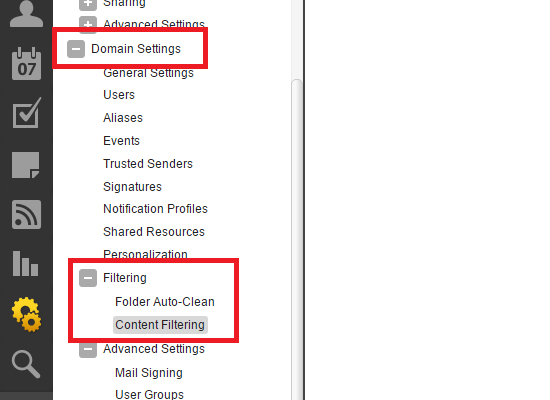 Account level email filters allow you to set up filters and rules that are specific for that email account. Note, if there are domain-level email filters in place, the evaluation of domain filters takes place before the evaluation of account filters. Log into webmail using the email address and password of the account you want to create email filtering rules. From the left menu, select Settings and expend the Filtering options. If you have chosen multiple criteria in Step 6, you can now specify if you want to use the “And” modifier or the “Or” modifier. For each of the criteria you have chosen in Step 6, you will need to enter the details. For example, if you chose to filter on From address, you will need to enter an email address in the box. When ready, click Next to proceed. For each filter rule you create, you can choose from a selection of actions.